The Large Underground Xenon (LUX) dark matter experiment, which operates nearly a mile underground at the Sanford Underground Research Facility (SURF) in the Black Hills of South Dakota, has already proven itself to be the most sensitive detector in the hunt for dark matter, the unseen stuff believed to account for most of the matter in the universe. Now, a new set of calibration techniques employed by LUX scientists has again dramatically improved the detector's sensitivity. Researchers with LUX are looking for WIMPs, or weakly interacting massive particles, which are among the leading candidates for dark matter. "We have improved the sensitivity of LUX by more than a factor of 20 for low-mass dark matter particles, significantly enhancing our ability to look for WIMPs," said Rick Gaitskell, professor of physics at Brown University and co-spokesperson for the LUX experiment. "It is vital that we continue to push the capabilities of our detector in the search for the elusive dark matter particles," Gaitskell said. LUX improvements, coupled to advanced computer simulations at the U.S. Department of Energy's Lawrence Berkeley National Laboratory's (Berkeley Lab) National Energy Research Scientific Computing Center (NERSC) and Brown University's Center for Computation and Visualization (CCV), have allowed scientists to test additional particle models of dark matter that now can be excluded from the search. NERSC also stores large volumes of LUX data—measured in trillions of bytes, or terabytes—and Berkeley Lab has a growing role in the LUX collaboration. Scientists are confident that dark matter exists because the effects of its gravity can be seen in the rotation of galaxies and in the way light bends as it travels through the universe. Because WIMPs are thought to interact with other matter only on very rare occasions, they have yet to be detected directly. "We have looked for dark matter particles during the experiment's first three-month run, but are exploiting new calibration techniques better pinning down how they would appear to our detector," said Alastair Currie of Imperial College London, a LUX researcher. "These calibrations have deepened our understanding of the response of xenon to dark matter, and to backgrounds. This allows us to search, with improved confidence, for particles that we hadn't previously known would be visible to LUX." The new research is described in a paper submitted to Physical Review Letters. The work reexamines data collected during LUX's first three-month run in 2013 and helps to rule out the possibility of dark matter detections at low-mass ranges where other experiments had previously reported potential detections. 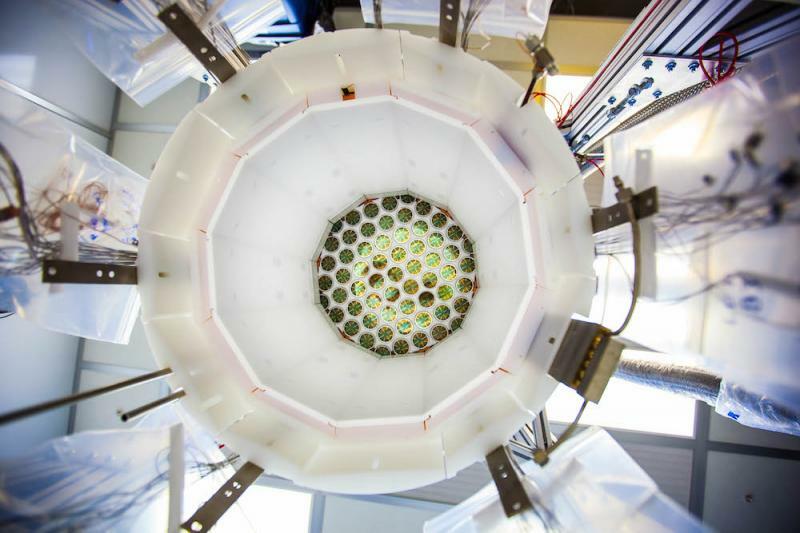 LUX consists of one-third ton of liquid xenon surrounded with sensitive light detectors. It is designed to identify the very rare occasions when a dark matter particle collides with a xenon atom inside the detector. When a collision happens, a xenon atom will recoil and emit a tiny flash of light, which is detected by LUX's light sensors. 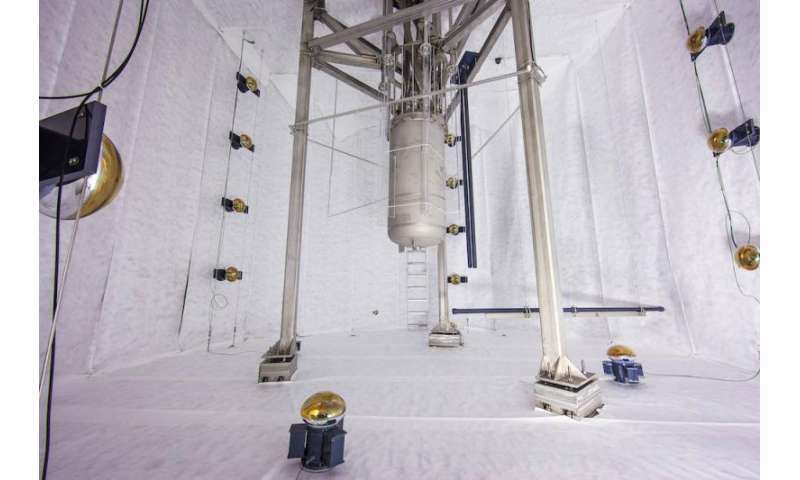 The detector's location at Sanford Lab beneath a mile of rock helps to shield it from cosmic rays and other radiation that would interfere with a dark matter signal. 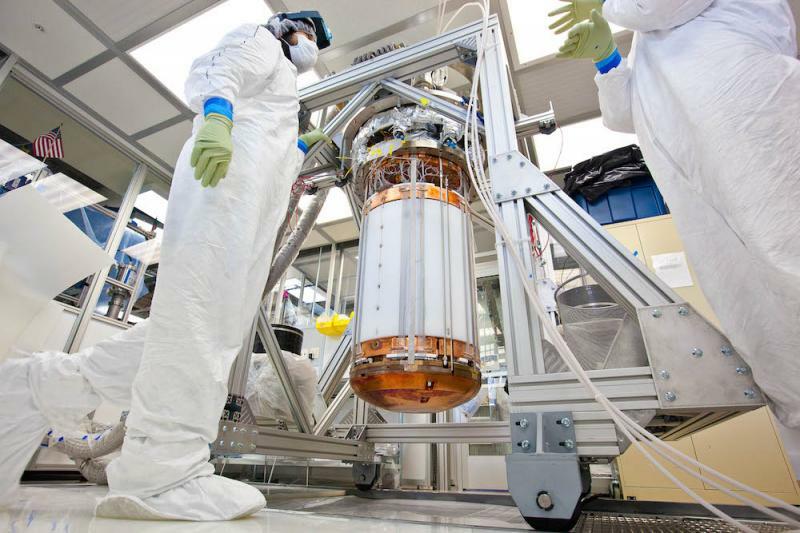 So far LUX hasn't detected a dark matter signal, but its exquisite sensitivity has allowed scientists to all but rule out vast mass ranges where dark matter particles might exist. These new calibrations increase that sensitivity even further. "It is like a giant game of pool with a neutron as the cue ball and the xenon atoms as the stripes and solids," Gaitskell said. "We can track the neutron to deduce the details of the xenon recoil, and calibrate the response of LUX better than anything previously possible." The nature of the interaction between neutrons and xenon atoms is thought to be very similar to the interaction between dark matter and xenon. "It's just that dark matter particles interact very much more weakly—about a million-million-million-million times more weakly," Gaitskell said. The neutron experiments help to calibrate the detector for interactions with the xenon nucleus. But LUX scientists have also calibrated the detector's response to the deposition of small amounts of energy by struck atomic electrons. That's done by injecting tritiated methane—a radioactive gas—into the detector. "In a typical science run, most of what LUX sees are background electron recoil events," said Carter Hall a University of Maryland professor. "Tritiated methane is a convenient source of similar events, and we've now studied hundreds of thousands of its decays in LUX. This gives us confidence that we won't mistake these garden-variety events for dark matter." "The krypton mixes uniformly in the liquid xenon and emits radiation with a known, specific energy, but then quickly decays away to a stable, non-radioactive form," said Dan McKinsey, a UC Berkeley physics professor and co-spokesperson for LUX who is also an affiliate with Berkeley Lab. By precisely measuring the light and charge produced by this interaction, researchers can effectively filter out background events from their search. "And so the search continues," McKinsey said. 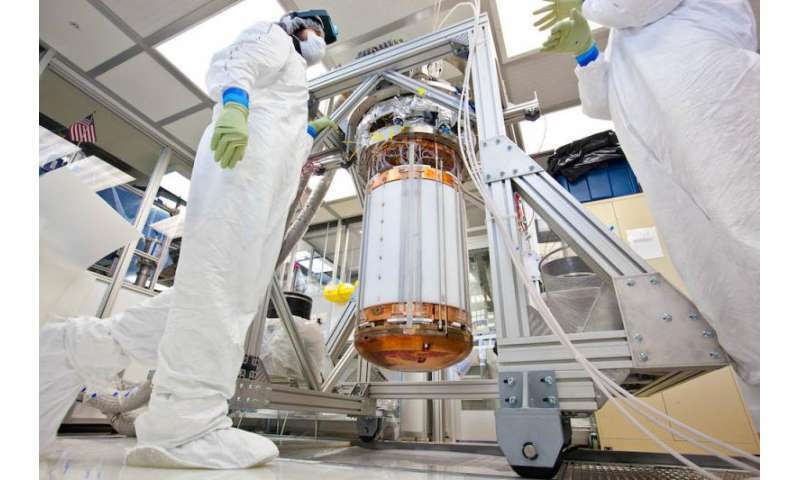 "LUX is once again in dark matter detection mode at Sanford Lab. The latest run began in late 2014 and is expected to continue until June 2016. This run will represent an increase in exposure of more than four times compared to our previous 2013 run. We will be very excited to see if any dark matter particles have shown themselves in the new data." McKinsey, formerly at Yale University, joined UC Berkeley and Berkeley Lab in July, accompanied by members of his research team. The Sanford Lab is a South Dakota-owned facility. Homestake Mining Co. donated its gold mine in Lead to the South Dakota Science and Technology Authority (SDSTA), which reopened the facility in 2007 with $40 million in funding from the South Dakota State Legislature and a $70 million donation from philanthropist T. Denny Sanford. The U.S. Department of Energy (DOE) supports Sanford Lab's operations. Kevin Lesko, who oversees SURF operations and leads the Dark Matter Research Group at Berkeley Lab, said, "It's good to see that the experiments installed in SURF continue to produce world-leading results." The LUX scientific collaboration, which is supported by the DOE and National Science Foundation (NSF), includes 19 research universities and national laboratories in the United States, the United Kingdom and Portugal. "The global search for dark matter aims to answer one of the biggest questions about the makeup of our universe. We're proud to support the LUX collaboration and congratulate them on achieving an even greater level of sensitivity," said Mike Headley, Executive Director of the SDSTA. 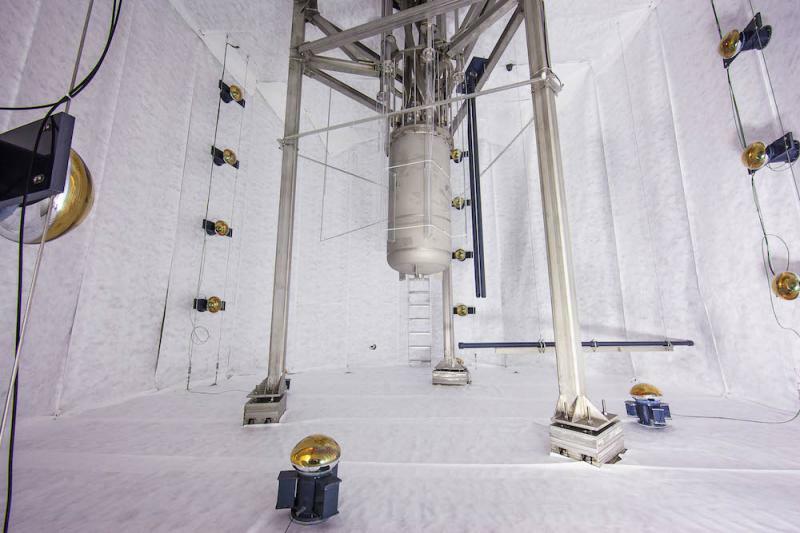 Planning for the next-generation dark matter experiment at Sanford Lab is already under way. 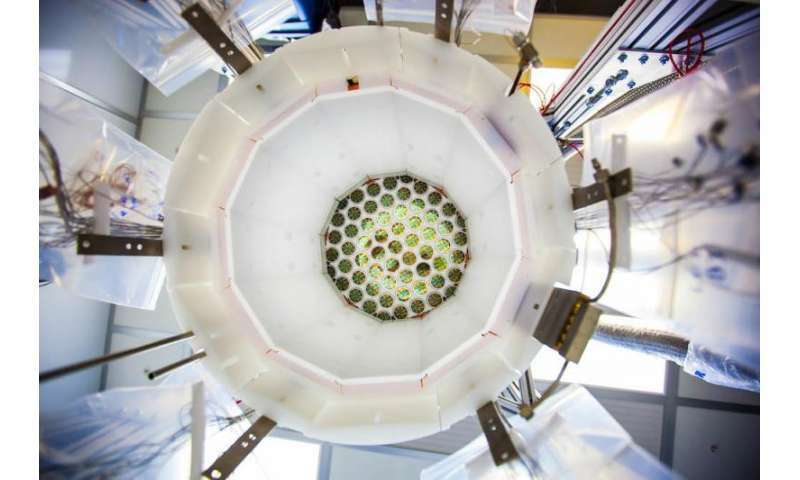 In late 2016 LUX will be decommissioned to make way for a new, much larger xenon detector, known as the LUX-ZEPLIN (LZ) experiment. LZ would have a 10-ton liquid xenon target, which will fit inside the same 72,000-gallon tank of pure water used by LUX. Berkeley Lab scientists will have major leadership roles in the LZ collaboration. "The innovations of the LUX experiment form the foundation for the LZ experiment, which is planned to achieve over 100 times the sensitivity of LUX. The LZ experiment is so sensitive that it should begin to detect a type of neutrino originating in the Sun that even Ray Davis' Nobel Prize-winning experiment at the Homestake mine was unable to detect," according to Harry Nelson of UC Santa Barbara, spokesperson for LZ.